Why do we take X-rays when planning orthodontic treatment? There are three main X-rays that I take when planning orthodontic treatment for my patients. These are the Dentopantomogram (DPT or OPG), Lateral Cephalogram (Lateral Ceph) and the Upper Standard Occlusal (USO). I don’t always take all three for every patient as the X-ray choice is patient specific, but this article will give you an idea of what each X-ray is for. DPT – This X-ray is taken in a big X-ray machine. The patient stands in front of the main vertical pillar and is asked to bite onto a small plastic stick protruding out from the pillar. After careful positioning the patient is asked to stand absolutely still for approximately 10 seconds while the X-ray tube and film rotate around the patient’s head. This X-ray gives an overall view of the teeth and jaws. I would never fit orthodontic appliances without viewing a recent DPT. This X-ray shows all the teeth in the jaw. This is the X-ray that will determine if a patient is dentally fit and suitable for braces. Firstly I have a quick overall look at the top and bottom jaw and the jaw joint to make sure it all looks reasonably symmetrical and there is no obvious abnormality. 99% of the time this is all fine. I count the teeth to make sure the teeth I expect to see are present. It is not uncommon to find an extra tooth, or occasionally a tooth in the bone that never came through. Sometimes teeth are missing. This can be because they never formed in the first place or they were extracted, either as a part of previous orthodontic treatment, or due to decay. I check the health of the teeth to see if there is any decay in any teeth or infections associated with any teeth. This X-ray is not the best view to identify dental decay, however, if I do suspect dental decay then I write to the patient’s dentist and ask them to take more detailed X-rays to assess the teeth. I do not start any treatment until all the decay has been removed and the patient is dentally fit. I check the roots of all the teeth. The roots of the teeth are the part of the teeth inside the gum. I see them as the ‘foundations’ of the teeth that secure the teeth in the bone. One side effect of brace treatment is slight shortening of the roots. It is not unusual to lose 1-2mm from the ends of the roots after brace treatment, however very rarely a significant amount of root can be lost. This root shortening is called ‘root resorption’. When I am looking at the X-ray, I am looking to see if there are any teeth with short roots already. If these teeth lose any more root length then the tooth may become mobile. If someone has had brace treatment in the past, I am particularly interested to see how the roots have been affected by previous treatment. In some cases I may advise against orthodontic treatment if the roots are already short. Alternatively, I may warn the patient that certain teeth may be at risk. We may then jointly make the decision to change the treatment goal posts and finish treatment as quickly as possible. I check the bone levels that are supporting the teeth. The roots of the teeth sit in bone, so going back to my analogy, if the roots are the ‘foundation’ then the bone is the ‘ground’ that the roots sit in. If a patient has a history of gum disease, then there may have been bone loss (ie the ground level is lower), so the teeth are not held securely in the mouth. This bone loss may be very localised around one or two teeth, or it may be generalised with a low level of bone support around all the teeth. With low bone levels there are two main risks. The first is that if the gum disease recurs during brace treatment then the bone loss will get worse and then the teeth will have even less support and may become loose. The second is that with limited root in the bone, if there is any root shortening as a side effect of the brace treatment, then there will be even less root in the limited bone, thus making the tooth become loose. I do treat patients with bone loss, but only when: the roots are long enough in the areas of limited bone, the patient has no active gum disease, the patient has excellent oral hygiene and the patient commits to 3 monthly hygiene cleans with their dentist during the course of their treatment. In part 2, Dr. Mistry looks at two other types of X-ray images taken during orthodontic treatment planning. I’m very grateful to Dr Paroo Mistry for writing these articles for my blog and I’m sure you will see more articles from her appearing in the future. 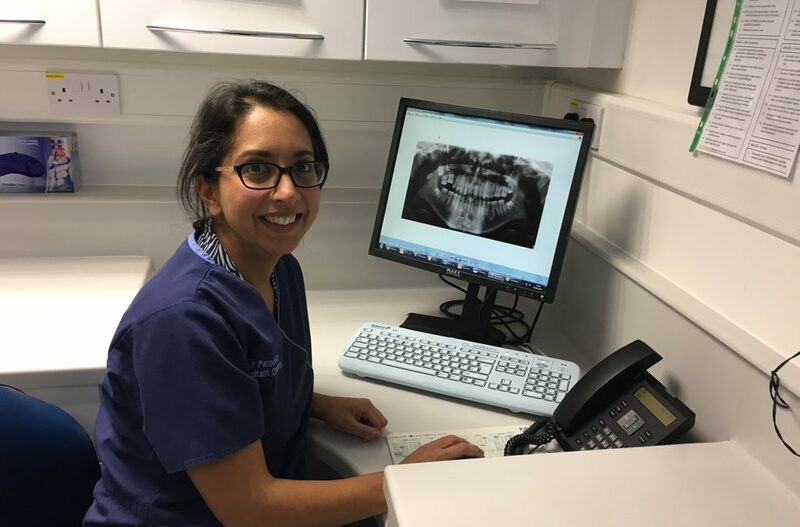 Dr. Paroo Mistry is the Specialist Orthodontist at Oakwood Orthodontics as well as a Consultant Orthodontist at Chase Farm Hospital in North London.